From the Hancock County Courthouse, go southwest on Hwy 22 for 8.8 miles to past the Southwest Elementary School. Follow a driveway which loops off Hwy 22 to the left. The cemetery is on the driveway's east side and immediately next to the driveway. 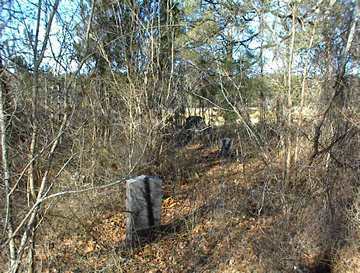 However, the cemetery is in a thicket and is only visible from the driveway in winter. The cemetery is approximately 200 feet off the left side of Hwy 22. Brother of Elmira A. Kennedy, per Katherine Bray. Brook's Co, Terrell's Ga. Light Arty. Co. I, 59th Ga. Inf. Co. F, 9th Ga Inf. Co. E., 7th Ga Cav. Co. C, 7th Ga Cav.